Mailbox for the Mac will sport a relatively traditional 3-column layout with a minimalist design that matches up with its iOS counterpart. Users will be able to control the app with gestures using the built-in trackpad on Apple's laptops or on the desktop with the Magic Trackpad, according to TechCrunch. Also coming along for the ride is a new "auto swipe" feature that learns which emails users regularly delete and automatically archives them in the future. The updates will mark the first major changes to Mailbox since Dropbox acquired the company last year for what sources have said was between $50 million and $100 million. 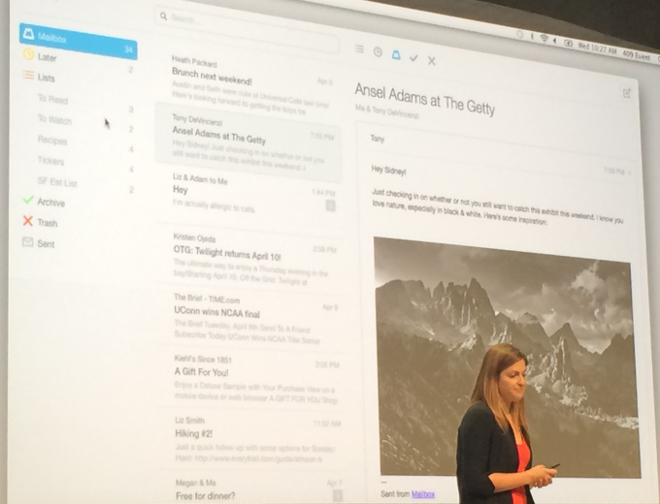 Users can sign up for beta access to Mailbox for Mac at Mailbox's website. There was no word on when a new version of Mailbox for iOS will hit the App Store with the updated auto swipe functionality. Carousel will store "every photo and video you've ever taken" and access them through dedicated apps for iOS and Android, the company said. Each file will be backed up to Dropbox automatically. The app organizes files in a manner similar to Apple's iOS 7 photos app, allowing users to scrub through their library chronologically. Users can also share media with any other person using either a phone number or email address, and the recipient is not required to have a Dropbox account. Carousel will be available as a free download from the App Store later today.